Are you ready for the next task? Today we are going to get rid of unused make up / skincare / haircare products. Yup. Not an easy task for those cosmetic queen or beauty product hoarders amongst us. I love discovering a wonderful new beauty product for my hair or my skin. The only problem is that I usually already have something similar at home. 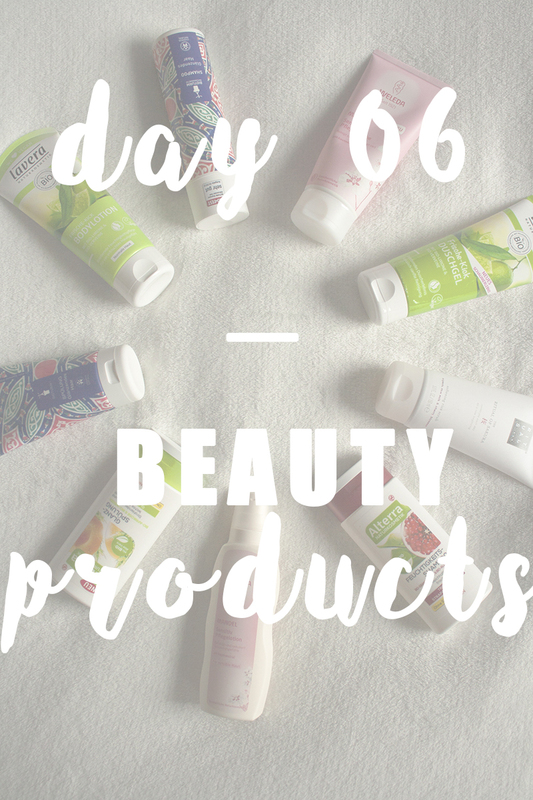 Over the past years I've accumulated so many natural skincare products that there is barely any space left for the ones I actually use on a daily basis... Time to declutter the mess! Will I use it soon? Does this product bring me happiness or joy? Do I already own a similar product – or several? Are any of the products out of date? Are any of them broken? Would I buy the same product again right now? Clean the empty shelves and drawers. What about that stunning body highlighter that you bought over a year ago and haven't used more than once? And what about all those half used bottles and jars that you've mostly forgotten about? Check for expiration and toxic ingredients. Here is a list of ingredients to avoid in beauty products. 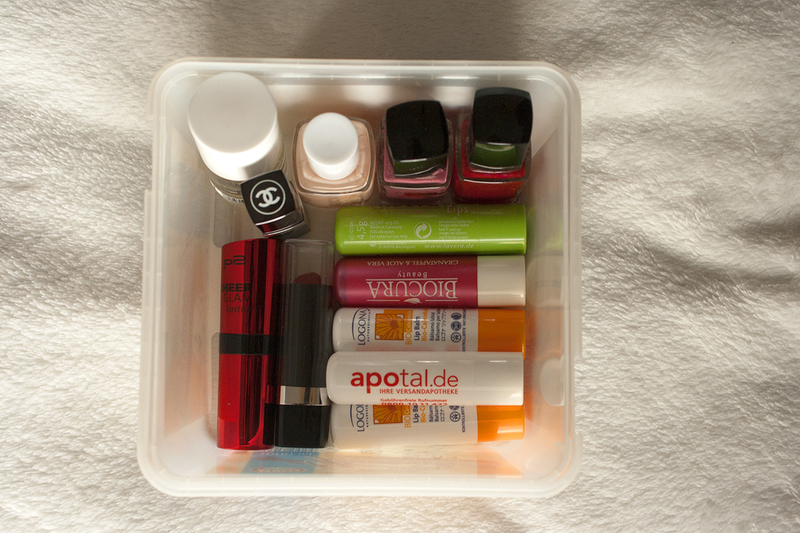 Separate your beauty products into 3 groups: keep, throw out and give away. 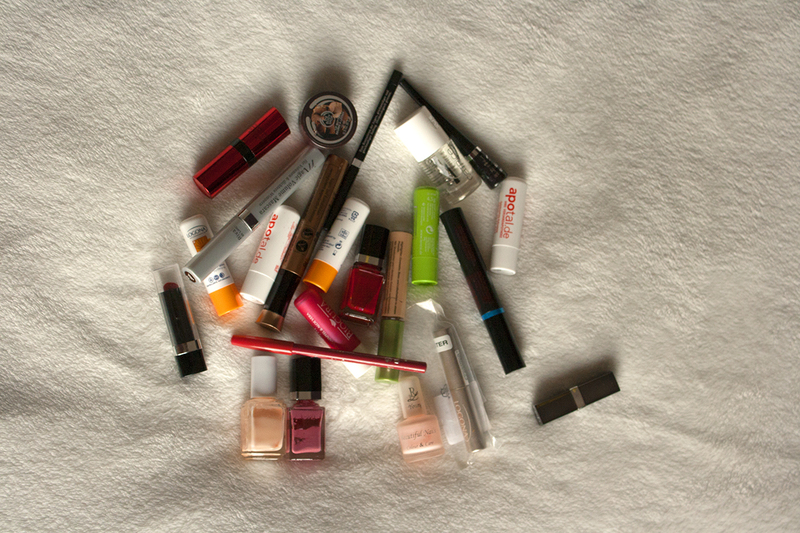 I know, cosmetics can be expensive, which can make you think twice about getting rid of it. However, like everything else in life if you don't use it or it doesn't add value then there is no point in keeping it. Don't keep things "just in case". Hotel freebies and duplicates are a perfect example of things we don't actually need, but still can't resist taking home with us. To help you with the decision, use up what you have but don't repurchase it to see if you actually needed it in the first place. Also think about which products you could multipurpose in the future – e.g. using coconut oil as shaving cream, make up remover, body oil and hair mask, using your hand cream for your feet too, or using a bar of soap for your face, your hands and your body and hair. Or just make your own! There are plenty of tutorials and recipes for homemade cosmetics on the internet. Put the products you decided to keep back into their designated home. Maybe try a new storage system, for example dividing everything into 3 baskets or drawers: 1) make up products, 2) products you don't use daily (such as sunscreen, foot cream, body scrub, conditioner, bath salts, body oil etc), and 3) products you use daily (such as tooth paste, lip balm, deodorant, face wash, mascara etc) aka your "can't-live-without"s.
To make future decluttering sessions easier, make it a habit to write the expiry date onto each bottle! The great thing about beauty products is that they have an expiry date that makes it easy to decide whether to keep or toss a product. Discard any products that are expired, broken or worryingly discoloured. Empty products which packaging can be recycled or reused. Give away any products that are still in date but that you don't actually use or need to friends or family members who will get better use out of it. You deserve a pat on the back, my friend! Well done. You could celebrate by doing a little at home spa day tonight! Pamper your face, your hair or your feet, or all of the above, and enjoy your neatly organized cosmetics collection.